Sailing into Merichas Harbor on the Greek island of Kithnos on your own, rented sailboat, you can take in the sights. KEA ISLAND, Greece – Menus? Leave them for the tourists, our skipper admonishes my husband, Joe, and me as we walk into one of the half-dozen tavernas lining the marina. We meekly follow the proprietress and our skipper, Yannis Lekkas, through a swinging door into the kitchen, where Anna deftly pulls open an ice-filled drawer packed with the day's catch. We watch the pair haggle loudly and with much hand gesturing over our culinary fate. Many yacht charter companies have Web sites that allow you to view the boats, plan your ports of call, view prices and exchange information via e-mail. Fodor's fifth edition travel guide of Greece also offers an extensive list of outfitters and yacht associations, many with U.S.-based brokers. We consulted an independent Web site, www.sailingissues.com, that provides personal recommendations and helps folks stay away from disreputable charter operations. Our one-week charter cost $2,900, plus a $250 tip for the skipper and minor marina and fuel charges. An hour later, we strip clean the bones of six fried red fish coated in a crispy, delectable seasoning and toast Lekkas with the ouzo sent over from a neighboring table of Swiss sailors. And so it began, the glorious September week we sailed the Greek Isles on a 32-foot chartered sailboat, just the two of us and a hired skipper. We pulled up anchor each morning, set a course across the Aegean Sea and moored at a different harbor every night. Our days consisted of swimming in clear water the color of jewels, strolling amid 2,500-year-old Greek ruins, and soaking up architectural, cultural and culinary delights. All told, we landed on six islands in the Cyclades region of the Aegean – Kea, Kithnos, Siros, Mikonos, Delos and Rineia. Neither of us had ever sailed. So what possessed us to go to sea halfway around the world? I had long dreamed of traveling to Greece, and during my research, I stumbled across a Web site with a travel log written by a U.S. family that had voyaged on a chartered sailboat in the Greek Isles. It was perfect. It appealed to our adventurous nature, but it was tame enough for a couple of middle-aged suburbanites to handle. Our journey began in earnest with an hourlong taxi ride from downtown Athens to the port of Lavrio, where we met our skipper and inspected the Filyra, our floating home for the week. I awoke after our first night aboard to face my first lesson under a Greek skipper's command: Coffee is very important. Lekkas taught me to enjoy the sweet, thick Greek coffee. It was the first of many lessons. A veteran sailor in his early 50s with a wry sense of humor and a classic Greek profile, he was more than our skipper: He was our culture coach. We watched him closely and learned to eat dinner when Greeks eat, about 8 or 9 p.m., and shop each day in the harbor village for fresh bread, feta cheese, vegetables, fruit and wine. He even cooked omelets and made sliced tomato and cucumber salads for us as we bobbed lazily under the golden Greek sun. He began by teaching us to sail. We didn't have to work. Lekkas could sail without us – probably a lot easier – but we wanted to learn. And even though Lekkas spoke perfect English, it wasn't always perfectly clear what he was trying to tell us. The sails were rigged with color-coded lines, or ropes, and controlled with winches and clamps. To change direction, the skipper adjusts the angle of the sails through the manipulation of the lines. From his perch behind the helm, Lekkas yelled directions to his rookie crew. "Liberate the blue one!" he hollered over the noise of the sea. Huh? Oh, release the clamp on the blue line. "They are confused! Unconfuse them!" We berthed each night alongside other sailboats in a harbor that typically faced a row of tavernas. Their proximity proved both a blessing and a curse. Remember the Swiss sailors who sent us ouzo our first night? They sang until the wee hours of the morning about 200 feet from our bed. And we couldn't shake them. The Aegean has more than 1,400 islands, and we found ourselves docked with the Swiss three times. To top it off, they bathed naked each morning from the back of their boat, using an outdoor shower attachment. Singing is a common event in Greek tavernas. It was only a matter of time before Joe, an accomplished singer and guitarist, added his voice to the tradition. After a dinner of meatballs and cucumber-tomato salad at an outdoor taverna in Merichas, a Kithnos harbor village, Joe picked up a guitar. It was old and out of tune, but within minutes, Joe was taking requests for American rock 'n' roll from the locals and a table of young Canadian women also on a sailing vacation. But we did more than eat and drink. Picture-perfect Mikonos, where the rich and famous come to party, looks as if it had been constructed in Disneyland. Stone-lined streets – narrow and crooked to thwart pirates – are home to chic and expensive shops where jewelry, especially, abounds. Buildings wear traditional colors of deep blue and dazzling white, and flowers hang from the window boxes. The town beautifully complements Mother Nature's work, the unbelievably blue Aegean Sea. If you've seen only pictures, the water really is that color. Despite Mikonos' charm, our most memorable stop was Delos, a barren granite rock about 4 miles long and smothered with archaeological sites that date to the second century B.C. We began at the museum, which sells an invaluable guidebook to help decipher the acres of carved columns, edifices for the gods and goddesses, tile mosaics and theaters of stone. Excavation has been under way here since 1872, and the museum also showcases some fascinating artifacts, such as its famous stone lions that lined a marketplace from 110 B.C. 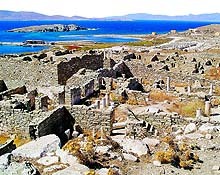 If you visit Delos and you have an interest in ancient Greek life, go early. The island closes at 3 p.m.
We learned another thing about ourselves on this trip: We like the sailor's life. On our first day at sea, Lekkas pulled on his slicker as we left the harbor, a sign we would come to know well. We moved into open water and the famous Aegean winds, called the meltemi, blew 30 knots, and the swells reached 5 to 6 feet. The Filyra rose and fell with a great clatter as roaring waves crashed over the bow, sending a cold, salty spray onto our faces. While we dipped into the trough, we lost sight of the horizon and watched a wall of surging water rise behind us. Lekkas watched our faces closely. "Are you all right?" he asked. He later told us that some clients become terrified or horribly seasick. Not us. We were wearing our anti-seasickness patches. We may be middle-aged suburbanites today, but tomorrow, we may just buy a boat and go to sea.